When trying to get someone’s attention, merely tapping them on the shoulder just doesn’t get the job done these days. In a world of countless 24-hour news channels, Twitter and instant celebrity, it has probably never been harder to get across a serious point given the deafening din created by the myriad of media outlets all vying to be heard. Mark Thomas doesn’t do shoulder taps. You could easily imagine him wrestling an effigy of Rupert Murdoch, outside the Houses of Parliament, dressed as an Ostrich in order to draw attention to the plight of Palestinians who had been stereotyped on Sky News. Ultimately his aim, as ever though, is to expose the farcical nature of certain injustices – reciprocating their idiocy with his own imitable brand of theatricality. Tonight the focus of his ire is gated communities, multinational corporations and out-of-touch local councils who have restricted the use of Britain’s cities (specifically London) and open spaces, at the expense/exclusion of the majority of residents. Before getting into the meat of the show we are treated to 30-minutes stand-up, as Thomas provides his own support act. The second half in fact sees an immediate change in pace as Thomas returns sans waistcoat. His frantic style is wrenched up as he paces back and forth, with the occasional pause to cross his arms and catch his breath, musing on various walks he has made across London, that have brought into focus just how elitist London has become, especially in regards to areas formerly meant for public forum. Malcom X claimed that “by any means necessary” was the best avenue to bring about change, and while Thomas doesn’t subscribe to violent action (cake is his weapon of choice) he certainly isn’t afraid to push the law to its absolute limits when trying to get his ideas out there. 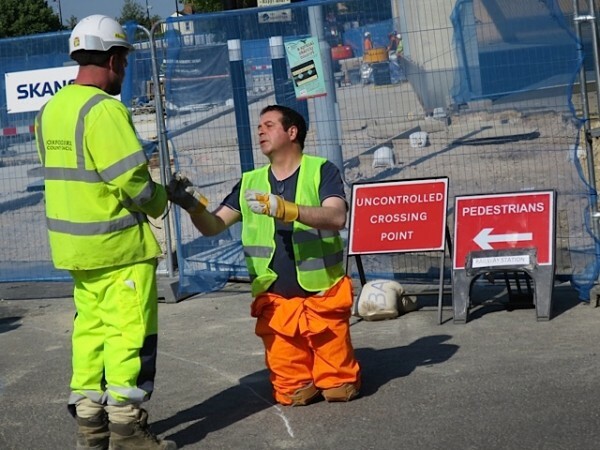 Clashes with security guards are an occupational hazard for Thomas, but his role is always the socially conscious joker – poking fun at the absurdity of men in high-viz jackets fending off so called “loiterers” from a 5m rectangle – people who are merely exercising their lawful right to walk or congregate in public. The idea of “social cleansing” that Thomas also brings to our attention (nearly 70% of new builds in the City of London are bought by wealthy non-UK residents) is perhaps the most important issue of the night, given the fact that this phenomenon has sent house prices spiralling out of control to levels that are simply not affordable to your average Londoner. As Woody Guthrie sang “this land is our land, this land is your land, this land was made for you and me”, Thomas couldn’t agree more. 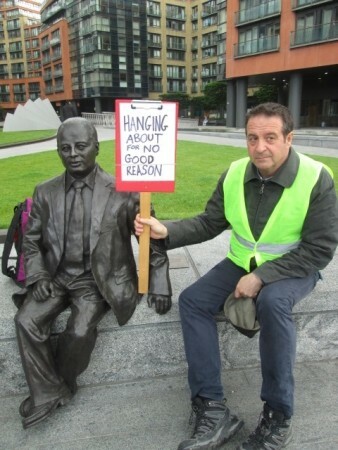 In an apathetic world Mark Thomas shines a light on yet another critical social issue that would otherwise pass by with out the attention it so greatly deserves; his methods being only as farcical as the behaviour of the perpetrators themselves. To find out more and get tickets click here. Tagged 2015, bristol, Kevin Mcgough, mark thomas, review, September, the fix, the fix magazine, tobacco factory, trespass. Bookmark the permalink.